The Clean Cooking Alliance Joins South Asia LPG Summit 2019 as Silver Sponsor! 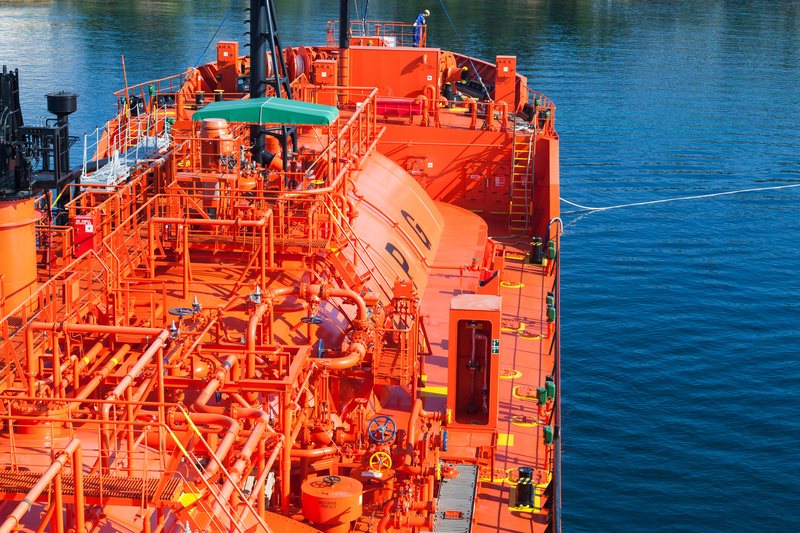 Bangladesh’s LNG Imports: LPG Demand to Boom or Bust? The Clean Cooking Alliance Joins South Asia LPG Summit 2019 as Silver Sponsors! LPG Summit would like to welcome the Clean Cooking Alliance for the very first time as our latest Silver Sponsor for South Asia LPG Summit in Dhaka, Bangladesh! We look forward to working with them and the WLPGA to help move the LPG industry forward where it is needed most! The Clean Cooking Alliance works with a global network of partners to build an industry that makes clean cooking accessible to the 3 billion people who live each day without it. The Clean Cooking Alliance believes that no one’s life should be limited by how they cook and here at LPG Summit we couldn’t agree more. Yet, cooking over polluting open fires and inefficient stoves causes widespread health, climate, economic, and environmental impacts across the globe. Women and girls are disproportionately affected, spending hours cooking, inhaling toxic smoke, and collecting fuels like wood and animal dung. Increasing investment community participation and global engagement around clean cooking. The Clean Cooking Alliance secretariat is guided by a Leadership Council composed of select high-level stakeholders, donors and experts who advise in all strategic matters, including decisions related to its mission, programmatic focus, growth, and development. Observing the current phase of rapid growth of the LPG industry in Bangladesh and considering the usefulness of creating a safe atmosphere where LPG is used, I have the initiative to prepare an article for the awareness of all concerned regarding the safety in handling LPG cylinders by end-users throughout the country. The article has been developed by gathering together information/tips/papers on ‘safe use’ of LPG. Because of the wide range of LPG applications and the variations in the scale of use, there are many categories of users, ranging from households to commercial and industrial uses. Leaking gas from sub-standard and damaged gas pipes. Incorrect installation of the regulator on gas cylinders. Installation of gas cylinders and gas ovens in fire prone locations. Leaving the kitchen room during cooking process. Use of improper cooking utensils. The government has already decided to shift pipeline gas to cylindered gas for the household use. As such, usage of cylinder gas is expected to increase by several times in the next few years. The importers and marketing companies of LPG are appointing dealers in district and Upazila levels to sell their LPG cylinders. The dealers are selling these cylinders through retail sellers. There is a regulation for acquiring a clearance license from the Department of Explosives for LPG importers and marketing companies to take necessary security measures for holding more than 10 cylinders. Unfortunately, in most of the cases, dealers and retail sellers are found to not be serious about this licensing at all. LPG cylinders are also being sold illegally in the market and this trend, unfortunately, has become so popular that, the LP gas cylinders are treated as just another regular grocery item. Accidents are often caused due to selling unfit and faulty cylinders which indicates the absence of proper security and quality control in almost every aspect of LPG cylinder marketing. In general, LP gas is supplied from the importer/supplier to the dealers and then sent to the retail sellers. In this case, the importers/suppliers have a practice of verifying the explosive directorate license of the dealers before appointing them. Unfortunately, the system is not being maintained properly in the cylinder distribution chain and hence is not being used by importers properly. In the face of depleting natural gas reserves, a move is underway to go for the installation of LPG reservoirs in residential buildings to meet household usage of LPG and make it mandatory by incorporating a provision in the Building Code. This mandatory provision, as part of the government’s new plan to replace the current piped gas with LPG, building owners have to introduce the LPG reservoir system on the ground floor or underground, so that the residents can use the gas from that system. LPG suppliers will fill the reservoirs and gas will go to residences through an internal LP Gas Service pipeline and there will be no need to individually carry any LPG cylinders from outside of the building premises. Some care and precautions are required to for use of LP gas to become 100% risk-free. LPG is highly combustible and flammable, so when it comes into contact with the source of any ignition in air, it will explode. Millions of people are utilizing LPG as the most convenient, economical and pollution-free cooking fuel throughout the world and Bangladesh is no exception. However, it does require safe handling procedures to be carried out to avoid any incidence of explosions. LPG is stored in the high tensile steel containers under high pressure but the high-pressure gas may start leaking from any weak rubber pipe, joint or sealed connector provided in the LPG container if not taken care of properly. Therefore, awareness about some statutory warnings and safety precautions can avert any accidental hazards while using this useful and popular cooking, industrial and automobile fuel. Install the LPG cylinders vertically in uncovered, airy and at a visible distance below the cooking platform. The cooking oven or any other ignition sources should not be kept in close proximity to the gas cylinder. Prior to turning on the gas cylinder in the morning, it should be ensured first, that no sign of gas accumulation has taken place overnight by completely opening all doors and windows in the room. Carrying out regular checking of the gas tube connections on both the cylinder and the oven/stove. Defective or damaged cylinder pipes should be replaced at regular intervals as this may be a source of gas leakage. Do not use any candle or match light to check for any signs of gas leakage from the cylinder. Do this instead by applying a solution of soap and water on the valve or pipe joints to detect possible gas leaks. The gas leaks will be identified visibly by the formation of bubbles. This should be done every time a new gas cylinder is connected. Spare or replaced cylinders should be kept at a safe distance from cylinders that are in use to prevent any residual gas from being accidentally ignited. Don’t keep any inflammable sources like kerosene, petrol, alcohol, etc or electrical equipment like micro-ovens, toasters and heaters in the kitchen or cooking area. If there is any indication of gas leakage in kitchen, do not turn on or off any electrical switches or other electrical accessories that are inside kitchen room, a spark from this action, can cause ignition if there is a gas leak. Immediately turn off the regulator valve to stop gas flow. Open the doors and windows to let out the accumulated gas. Wait for half an hour till all of the accumulated gas has completely escaped. Do not turn on regulator switch, gas oven or any other source of ignition in the kitchen till the room is completely free from leakage gas. If it is difficult to control the gas leak, then immediately inform the LPG supplier or Fire services to avoid any catastrophe. As a precautionary measure, it is wise to evacuate everyone from the affected area if the leak is not controllable. A miniature fire extinguisher is to be kept in-house and should be used immediately to extinguish any initial fire break-out from the gas cylinder. Following which, the fire brigade should be called if the fire does not come under immediate control. If uncontrollable, evacuate everyone from the building. Small fires can be extinguished immediately with the help of a wet cloth and followed by turning off the regulator switch immediately. The guidelines for safe use of LPG by end-users described above are derived from various sources for information and reference purposes only. As such, adoption of these may not meet the needs of any particular organization or individual, so, it is advised to consult with the qualified professional to obtain the advice required. In Western Europe, a concept known as ‘duty of care’ and in USA another concept known as ‘duty to inform’ have been found very appropriate for LPG consumers. Duty of care includes an obligation on the consumer to heed the safety information provided by the supplier as part of his duty to inform. The consumer should be supplied with clear and easy to read safety notices and instructions. Consumers should heed them properly and avoid a ‘do-it-yourself’ approach, to any LPG installations whether being used for household, commercial and industrial uses, including transport vehicles. This concept stated above should be adopted in Bangladesh to improve the safety of LPG use and to reduce casualties from LPG related accidents. Bangladesh’s population has crossed the 165-million mark, but less than 1% of the population in the cities and suburban areas can afford LPG. This is despite the fact that the LPG distribution system is extended to all 64 districts in Bangladesh and covered by more than 3,000 LPG retailers. The LPG market does grow in the South Asian country. The rural population is around 110 million, heavily outweighing the 55 million living in urban areas. LPG consumption is around 3.2 kg/capita and the poor continue to use firewood and biomass as their main fuel source. However, LPG usage is expected to rise as a consequence of depleting natural gas reserves in the country. With natural gas usage in power generation is driving the country’s consumption, the depleting gas fields will continue to put pressure on its use as a household fuel. 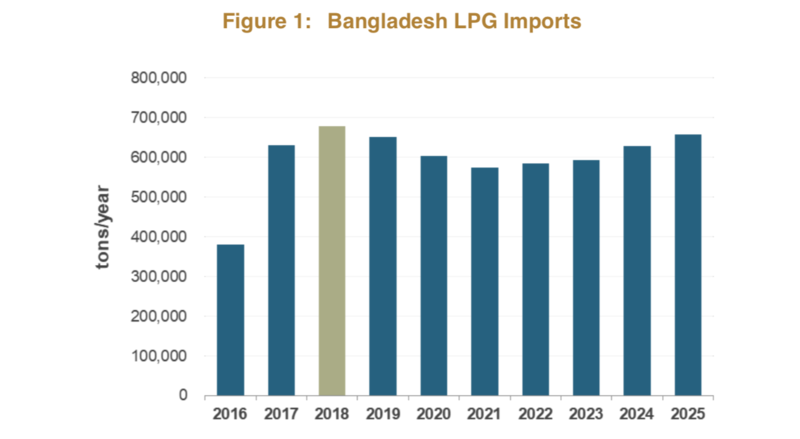 Bangladesh Petroleum Corporation (BPC) markets the domestically produced LPG—from the country’s sole refinery—through its subsidiary LP Gas Limited. LPG production amounts to a small volume of around 20,000 tons per year and is being fed to two bottling plants at Chittagong and Kailashtila. The low production number is attributed to the low LPG yield in domestic refineries(1.3-1.5%). BPC’s second refinery will likely commission in early-2023, increasing Bangladesh’s supply of refinery LPG. Bangladesh’s LPG stimulus is attributed to the shortage of natural gas, which has caused the government to halt many new gas connections to households and commercial users. With most of its major gas fields expected to be depleted by the late 2020s, Bangladesh turned towards LNG imports to address the gas shortage. While the FSRU Excellence arrived at Moheshkhali, south of Chittagong in April this year, the commissioning of the regasification facility met with several delays. Besides a faulty pipeline connection to the LNG terminal, strong tidal waves at the Bay of Bengal also interrupted its start-up. However, it is important to note that LNG is not expected to compete with LPG in the retail space as the Bangladeshi government prioritizes naturalvgas use in power generation, fertilizers and large-scale industrial use. Household use of LPG will still continue to grow as rural usage intensifies. 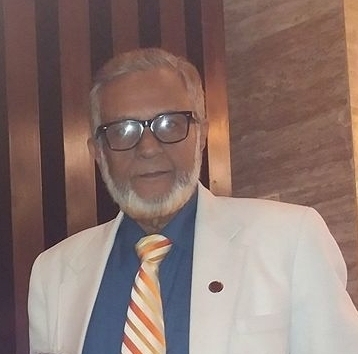 Furthermore, the Government has also pledged that 70% of existing household gas connections (which are heavily concentrated in Dhaka and Chittagong) will be replaced with LPG by 2020. Additionally, natural gas prices are expected to be hiked as the government is currently charging consumers below the cost of production. As Bangladesh becomes more dependent on costlier LNG imports, the Bangladesh Energy Regulatory Commission (BERC) is in the midst of accepting proposals put forth by Petrobangla and other gas companies to raise gas prices. Proposed hikes for the fertilizer, power and industrial sectors have been said to be as high as 372%, 206% and 93%, respectively, while retail LPG users remain exempt. All in all, any increase in gas prices certainly bodes well for LPG demand, as gas companies prioritize gas to the fertilizer, power and industrial sectors. The Petroleum Institute of East Africa together with the WLPGA will be organizing the PIEA-WLPGA Africa LPG Forum & Training Workshop 2019 at the Intercontinental Hotel in Nairobi, Kenya from 25th – 26th April 2019. LPG Summit is partnering with PIEA for this event as well as the 6th Africa LPG Summit, Dar Es Salaam, Tanzania in July.